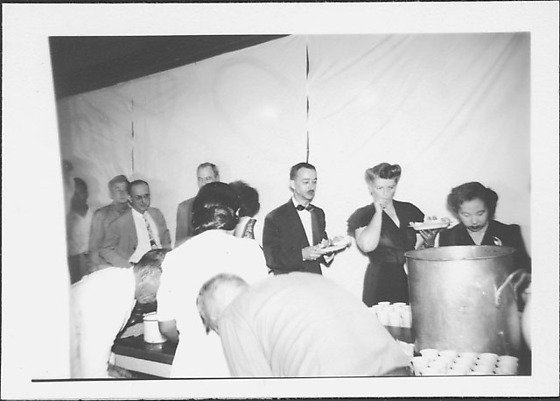 Caucasian men and women in formal dress stand in line on far side of counter getting food at mess hall at Rohwer concentration camp, Rohwer, Arkansas, June 2, 1945. One man holding a plate of food wears a tuxedo. The woman in front of him licks her fingers of proper right hand. Two men and a woman are stooping with backs to viewer on near side of counter in foreground. Large metal pot with handles and rows of paper cups are visible at BR. White sheets hang in background. Stamped on back, TC: JUN 2, 1945.